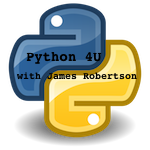 Python 4 You . .
A regular screencast series with short video tutorials on Python - an introduction to the language. You can subscribe to this series in iTunes, or in any other tool using this link.